In the early 1980s, as entrepreneur Madhavan Nayar (M.S. IE ’68) expanded his software consulting firm Unitech Systems from a staff of one man to many individuals, he adopted a nonconformist management philosophy. Inspired by the quality principles set forth by statistician W. Edwards Deming, Nayar chose collaboration as his company’s cornerstone. 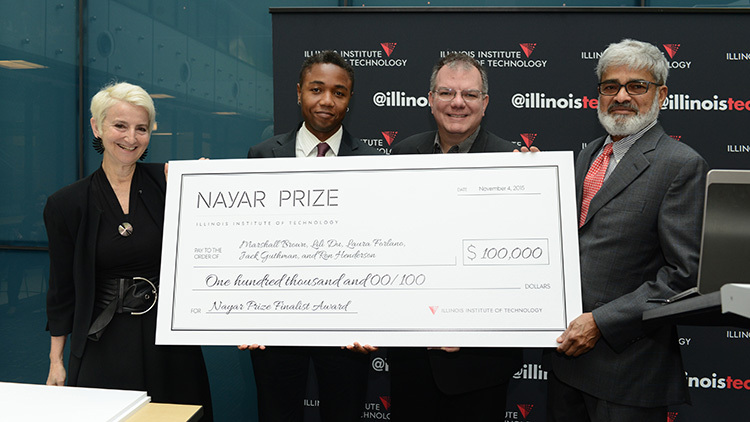 Unitech Systems, now known as Infogix, still exists today (it was sold in 2012 to a private equity investment firm) and its founder still believes in collaboration as exemplified by his $1 million gift to Illinois Tech to fund the Nayar Prize. The award supports university teams as they work to develop breakthrough, innovative projects that will produce meaningful results with a societal impact within a three-year period. On November 4, 2015, three teams of faculty researchers were presented with $100,000 each to jumpstart their efforts during the first year of the prize cycle. At the completion of this first year, only one team will advance to the next phase with $200,000 in additional funding. 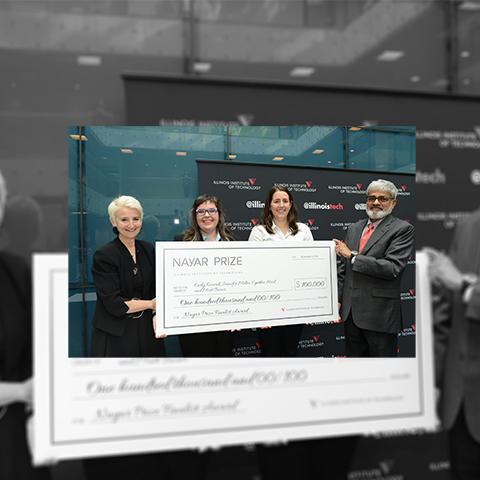 Upon the successful completion of benchmarks/performance metrics set by the team, members will receive the final $500,000 Nayar Prize. Kenneth Tichauer (Armour College of Engineering/Biomedical Engineering), Jovan Brankov (Armour College of Engineering/Electrical and Computer Engineering; Biomedical Engineering), and Rajendra Mehta (College of Science/Biology) are developing a new imaging system capable of spatially mapping the variable characteristics of cancers at the cellular level. 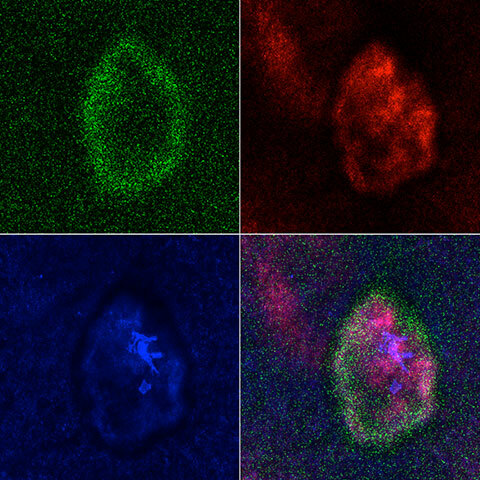 Tricolor fluorescence stain of cancer-specific molecules in a mouse model of human brain cancer, part of the Nayar Prize-funded project ADEPT Cancer Imager. 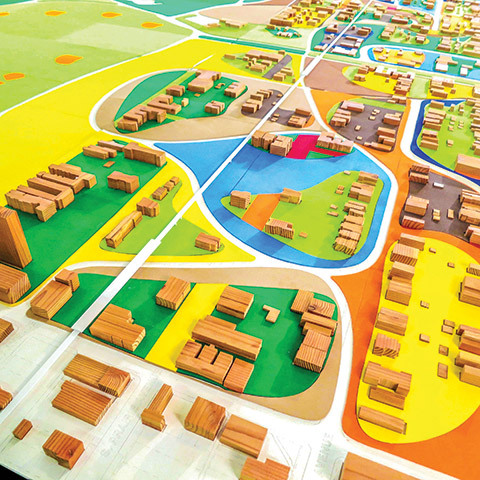 Marshall Brown (College of Architecture), Lili Du (Armour College of Engineering/Civil, Architectural, and Environmental Engineering), Laura Forlano (Institute of Design), Jack Guthman (planning attorney who formerly was with the College of Architecture), and Ron Henderson (College of Architecture) are exploring social scenarios, technical solutions, infrastructural prototypes, and model urban codes for the co-evolution of human and non-human transportation systems. As cities around the world consider opportunities for driverless cars, The Driverless City project will investigate the elements that will make change possible. Carly Kocurek (Lewis College of Human Sciences/Humanities), Jennifer Miller (Lewis College of Human Sciences/Psychology), Cynthia Hood (College of Science/Computer Science), and Matt Bauer (Lewis College of Human Sciences/Humanities) are designing a research-driven, high-impact interactive game for children ages 24–36 months that will help them to expand their vocabulary and be better prepared to succeed in school. 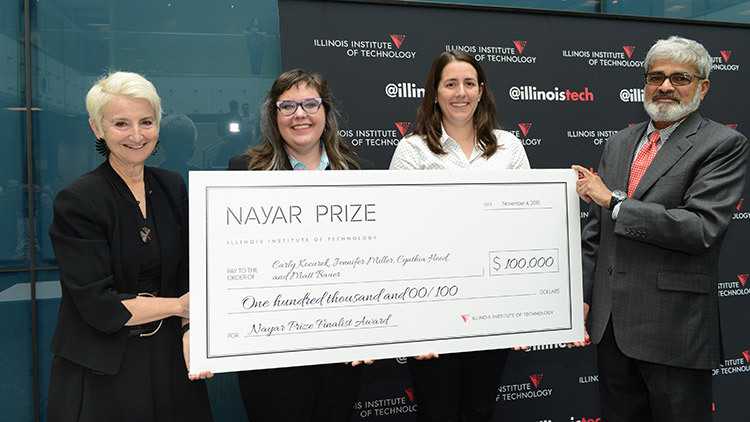 The six-member prize jury was composed of Frances Bronet, Illinois Tech provost and senior vice president for academic affairs; Illinois Tech Life Trustee Martin “Marty” Cooper (EE ’50, M.S. ’57), Trustee Chris Gladwin, and University Regent Ralph Wanger; Kathleen Brandenburg (M.Des. ’98), founder and chief design strategy officer of IA Collaborative; and Kiersten Muenchinger, associate professor and director of the Product Design Program at the University of Oregon. The jury, which received administrative support from Dennis Roberson, vice provost for research and Ganesh Raman, deputy vice provost for research, began reviewing applicant proposals in late September. 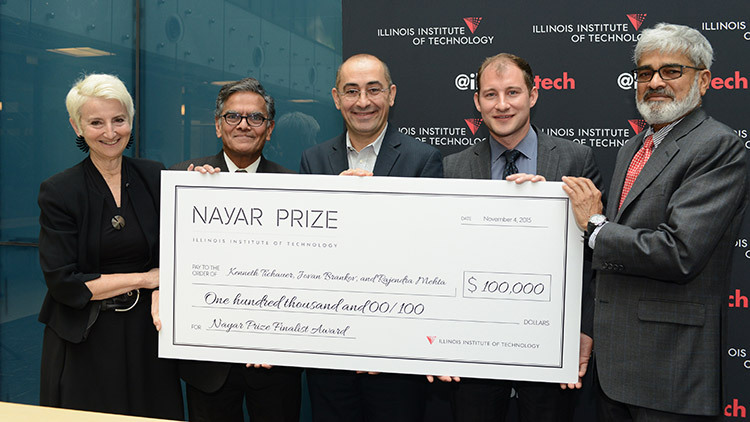 In establishing the prize, Nayar, his wife, Teresa, and the other members of the Nayar Family Foundation felt it important that members of the Illinois Tech academic community be recognized for their “extraordinary problem-solving abilities and their passion to make a real difference in our world.” Nayar received two bachelor of science degrees from universities in India and came to Illinois Tech to attain his Master of Science in Industrial Engineering. He recalls that as an international student he built a close affiliation and association with the university and says it became his home away from home. From that time, Nayar, now president of E-Prairie, LLC, has been actively involved with Illinois Tech in various roles—including membership on the Alumni Board International Committee and the university’s Board of Trustees—and wants more individuals to be aware of the impact the university can have on meeting many of the world’s challenges.